Meaningful and lasting change doesn’t happen in an instant. It requires effort and commitment over a sustained period of time. More than a single individual has to take up the banner and push the change initiative through, gaining buy-in from supporters and stakeholders, commitment of early adopters, leadership of role models and an aligned vision. Developing a new product innovation or promoting gender diversity in an institution is no different. Leadership and management training is one of the levers of change that organizations often use when embarking on any kind of change initiative. However, as anyone who has attended classroom training knows, translating new ideas into behavior change and, ultimately, into organizational change—and ideally impacting positively on clients—is a process that goes well beyond the classroom. Moreover, sending one or a few individuals to one-off trainings, though extremely valuable, is not always sufficient for making the leap from individual learning to systemic change. multiple touch points with individuals or institutions over time. Why are these two factors so important? When more than one person attends a training—or different trainings over time—they are better able to create a shared language around the lessons learned and are better placed to find a supporter or even a sponsor. Having two or more representatives from each organization who can work together to champion strategic business initiatives internally, further strengthens an institution’s potential to adopt new changes and promote important goals like product innovation or greater internal gender diversity. This is Women’s World Banking’s approach—offering multiple touch points for multiple individuals over time to systematically address the learning needs of leaders committed to institutionalizing gender diversity and innovation for serving the women’s market. Our work in Latin America in the first half of 2014 illustrates this approach. 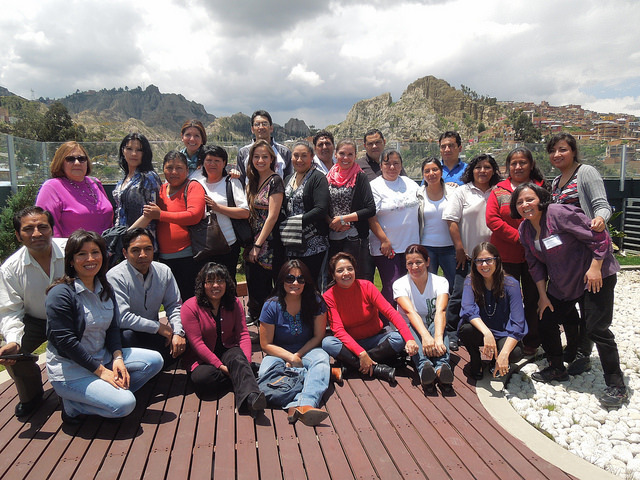 The 2013 winner of the Inter-American Awards for Financial Inclusion —Crecer, Crédito con Educación Rural in Bolivia received a tailored in-house Management Development Training for 24 of their middle managers (regional, area, and branch managers) in 2014. For Crecer, the program agenda resonated with the capacity-building needs of the institution and helped to ground and align their middle managers with the overall institutional mission by giving them the tools to develop their own capabilities and the capacity of their teams. Internal gender diversity is also very much on the agenda for Crecer. The General Manager at Crecer is clear that gender diversity is crucial to the success of their business. He spoke optimistically during the program opening about the future representation of women leaders in the financial sector, while noting that institutions still need to make special effort to attract, retain, and promote female talent in order to create a pipeline of women leaders for better serving their clients. Women’s World Banking, with the support of MetLife Foundation, delivered its regional Women in Leadership Program which focused on high-potential women leaders across Latin America and the Caribbean (LAC) to develop their leadership skills and help their organizations to better serve the low-income population with a diverse set of financial products and services. 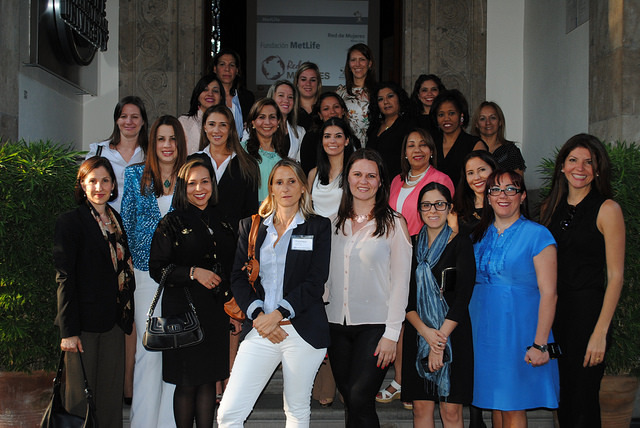 Twenty-two women representing 15 institutions in 8 countries in the LAC region participated in the 5-day course in Mexico City. Of the 15 participating institutions, six institutions sent multiple participants to the workshop and seven institutions had sent the CEO or other senior executive to a previous Women’s World Banking leadership development offering. This course targets high potential women leaders and managers who have demonstrated the ability to lead people in their organization and are motivated to take on new leadership challenges and opportunities. Banco WWB was selected to receive the Senior Management Program because of their proven commitment to investing in women leaders and having sent two of its own women leaders to the Women’s World Banking’s Women in Leadership Program in Mexico. 13 members of the Banco WWB executive team including the General Manager, vice president and area managers participated in the program. The program focused on understanding diverse personalities, improving communication processes, and strengthening collaboration and teamwork, thus better enabling the senior management team to meet their strategic objectives now and in the future. 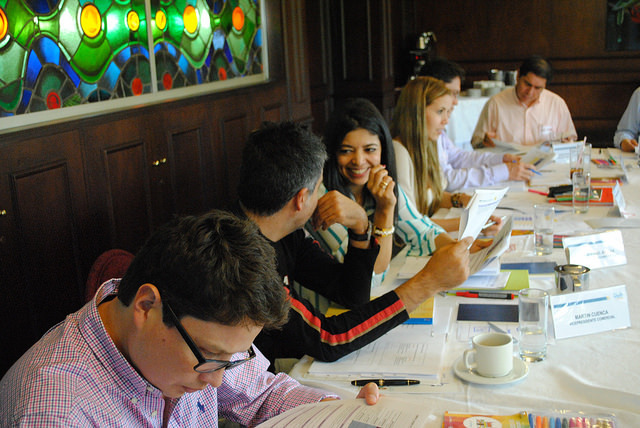 In order to design a customized training that would meet the bank’s specific and just-in-time needs, Women’s World Banking conducted a comprehensive assessment using one-on-one interviews and surveys with Banco WWB’s staff prior to designing and delivering the course. Participants left the program highly motivated to implement what they had learned and to fulfill the agreements and commitments generated during the program between team members. During a call with Banco WWB’s President after the training, he shared the many positive changes observed in individual team members and interactions among the team as a whole. These included improved self-awareness and appreciation for differences in styles and preferences, greater focus on effective communication and more collaboration. Achieving organizational change to better serve the women’s market requires the buy in, support, and effort of leaders and managers from field to board room. Attending training programs like ours that build on each other and target multiple participants across levels—middle, senior and executive leadership—helps ensure that leadership development is not a one-off but instead makes developing principled, gender diverse leaders committed to serving women clients part of organizational culture and strategy.